Hi everyone!! We only have a few days left this year. So today I will teach you one easy line that you can use until end of the year. = Yoi otoshi wo omukae kudasai. = Please have a good (new) year./Happy New Year! 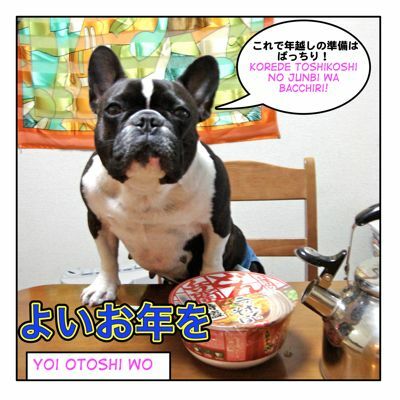 「よいお年を 」= yoi otoshi wo. can be Happy New Year but unlike English, you can’t say this phrase once a new year has started. We only say or write this phrase in December when you say good-bye. = Sorejaa yoi otoshi wo! We say this to a person when we think we won’t see them again until next year from the middle of December until the end of the year, not usually early in December. = Sukoshi (or Chotto) hayai desu ga yoi otoshi wo omukae kudasai. = It is a little early but please have a great year! よいお年を(お迎え下さい。） = Yoi otoshiwo (omukae kudasai). = Akemashite omedetou gozaimasu . we often say these lines as well. = Kotoshi mo iroiro osewani narimashita. = Thank you for everything you have done for me this year. =Mata rainen mo yoroshiku onegai itashimasu. =Thank you in advance for all your support for this coming year. = Kotoshi mo yoroshiku onegai itashimasu. = Thank you in advance for all your support for this (coming) year. So please remember this word picturing Maggie “Sensei” is running in December! = Nenmatsu (or shiwasu） wa batabata shite isogashii desu. = It is very hectic in the end of the year (or in December) . We are actually busy because we have to do many things. 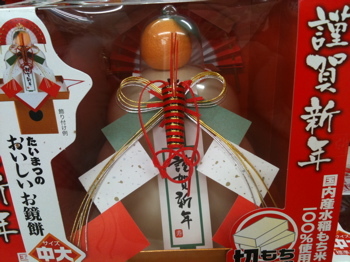 （お)鏡餅 = (o)kagami mochi = decorative round pounded mochi for New years. 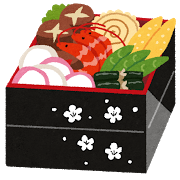 お節料理 = osechi ryouri = special New Year’s food prepared in square boxes. Also we have to finish writin. 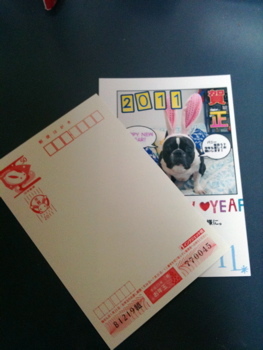 年賀状 = nengajou = new year’s cards and post them in December. 忘年会 = bounenkai = end-of-the-year party with their colleges, friends, etc. A party to forget about what you have suffered from through the year. 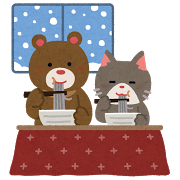 we customarily eat 年越し蕎麦 = toshikoshi soba = “year-crossing Japanese noodles” on New Year’s Eve. You have to eat it before January 1st. Maggie Sensei is ready to eat Soba noodles! 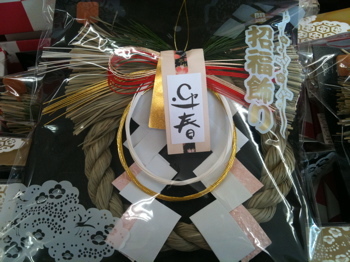 • 年越し = toshikoshi = to see out the old year and welcome in the new year. It used to be a big deal for Japanese people to watch NHK TV’s 紅白歌合戦 = kouhaku utagassen = Red and White Grand Song Festival (Red represents female singers and white represents male singers) on New Year’s Eve but their ratings have been decreasing in recent years due to competition from many more fun TV shows. There are now many more New Year’s Eve choices for television audiences. 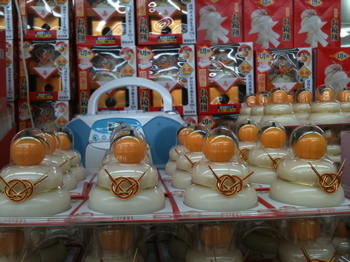 At midnight, people listen to 除夜の鐘 = joya no kane = the sounding of temple bells. They stroke 108 times in accordance with the number of our 煩悩 = bonnou = worldly desires to remove them. They broadcast the sounding of bells from temples all over Japan. 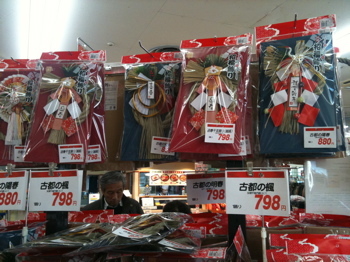 Many people go to 初詣 = hatsumoude = first visit of the shrine or temples from the middle of the night on New Year’s Eve. (I made this lesson in 2011 and it was a year of rabbit. = 卯年= usagi doshi. That is why I am wearing these bunny ears. = Maggie no saito wa minasan no ai de sasaerarete imasu. =Maggie Sensei’s site is supported by your love. = Koremade no minasan no atatakai ouen ni kokoro kara kansha shiteimasu. = I sincerely appreciate all your warm support up to now. =Douka korekara mo yoroshiku onegai shimasu. = Thank you in advance for your continued support. = Soshite yoi otoshi wo omukae kudasai. = And have a Happy New Year!! Thankyou for the onlibne teaching . Has helped me a lot! … am studying japanese language for 1 year now and your site is one of my source if I need to seek further understanding about a subject. Happy New Year!!! I’m very happy to hear you have been using my site for a year. I will make more and more lessons for you this year!! = Kongotomo yoroshiku onegai moushiagemasu. = Kongotomo suenagaku yoroshiku onegai moushiagemasu. Yes, you can say 大変感謝しています。= Taihen kansha shiteimasu. It is used in more formal or business situation though. Thank you for your nice message!!! Hehe I hope you keep up your new year’s resolution. Great! That means I now have a new friend here! i love the new year, becuse my birthday is on the 4th day of the 1st month! Oh, Hi, sagi!! Thank you for checking the lesson and leaving the comment. How exciting! You can celebrate New Years and your birthday soon!!! This is the first comment of the year!! Thank you!! Please keep up with this site and continue to post up new things for us to learn! Thank you so much, sensei, for creating this web site. I haven’t been here for a while. Happy New Year and hope you get a ton of subscribers in the new year. oh..just wondering in this case, how come we don’t say 迎えてください?? Thank you, Top-san!! Haha more than having a tons of subscribers, I hope you keep coming to this site! お迎え下さい is more polite but you can say よいお年を迎えて下さい。too. Thank you for everything you have done for all actioneers this year! Thank you in advance for all your support for this coming year! I haven’t done a general house cleaning and cooked “Osechi” yet but I have an end of year party with my friends tomorrow night! Anyway, HAVE A HAPPY NEW YEAR!!! Heeey, Tama-chan! Thank YOU for your support,too!! I finished “oosouji”. Feel very clean now! Have fun tomorrow and Happy New Year,2U2!! !